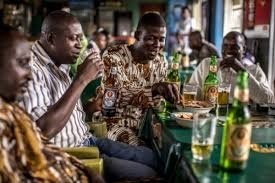 Alcohol sellers kick against the new law prohibiting production, sales and consumption of alcohol in parts of the Ilorin, the Kwara state capital. Gov. Abdulfatah Ahmed, on Tuesday signed into law a bill prohibiting the sale and use of alcohol in Ilorin, the Kwara state capital. The governor gave his assent to the law tagged “Ilorin Township (Prohibition Against the Production, Sale, and Consumption of Liquor in Certain Areas) Law, 2018. The new law stipulates that any person, who contravenes its provisions, would face a maximum fine of N100, 000 or a jail term not exceeding six months, or both. But those whose businesses would be affected are kicking against the move, afterall, they pay taxes to the government from this ‘unholy’ business. Chief Moses Ola, president of the Kwara chapter of the Cool Spots Association of Nigeria, said that the state House of Assembly shunned the plea of his members, to make input, while making the law. However, they just want to move on and he is pleading with the state government to either repeal or relax the law. He said the association was not consulted by the lawmakers before passing the bill. “We wrote to the Speaker, Dr Ali Ahmad, during the consideration of the bill, to invite and hear from us, but he replied that it was too late,’’ Ola said. He appealed to the governor to consider lifting the ban, because the business had been providing employment to some residents of the state. “We are also paying our taxes thereby contributing to economic growth of the state. Most of us are licensed to operate our cool spots”, he said. In separate interviews, operators of cool spots within Ilorin metropolis lamented the downturn of their businesses, following passage of the law. Mr Adeshina Atere, the operator of Happiness Bar in the Surulere area of the city lamented that the new law would throw many operators into joblessness. “It is with this business that we feed our families and send our children to schools. “I have been struggling for government job but couldn’t get. We want the governor to consider our situations’’. Another cool spots owner, simply identified as Mama Joy, stressed that since her husband died a decade ago, she had been running the bar to maintain the family.